There are no Knuckleballs in Space! Illustration credit & copyright: NASA. Relax we’re not going to be talking about Red Sox legend, Tim Wakefield or their current knuckleball ace Stephen Wright, but instead this is in regard to solar system bodies or we can safely assume bodies in any star system. Why does everything in the universe move and rotate? I meant to address this topic a year or so ago but for whatever reason it was lost in the web of my mind until I was asked about it this past week. Technically the question asked was, “Why doesn’t the Moon rotate?” The short answer is that it does rotate, but due to the fact that it takes 27.5 days to rotate counter-clockwise once on its axis while taking 27.5 days to orbit once in its counter-clockwise orbit around Earth, we here on Earth only ever see one side of it. Technically about 60% if we take libration into account. The term for this is a tidally locked or synchronous orbit and they exist all throughout the solar system. Jupiter and Saturn have many examples of tidally locked moons but if you haven’t given this much thought and or don’t happen to know much about orbital mechanics it’s very reasonable to think that the Moon doesn’t rotate. Ok, so that point out of the way, why does everything in the universe move and rotate? The “Why does everything move?” move part is easy. Gravity is everywhere; it pervades the universe so if you happen to be in the universe you’re moving relative to something. Rotation however is slightly more complex but once you understand the basic physics involved (for me basic might even be overstating it) it’s not that difficult to understand. In the beginning…..ok let’s not go back that far, let’s just use the formation of our solar system some 4.5 billion years ago. As the dust and material from long dead population II and III stars (Sun is a population 1 star) coalesced under mutual gravity, it created a region of prime star forming material. Due to some areas being denser than others, a domino effect forced the molecular cloud to begin to collapse in onto the densest region. As this happened, the conservation of angular momentum was forced into play and the region began to rotate, in the solar system’s case, counter (anti) clockwise if we were to look down on it from above. 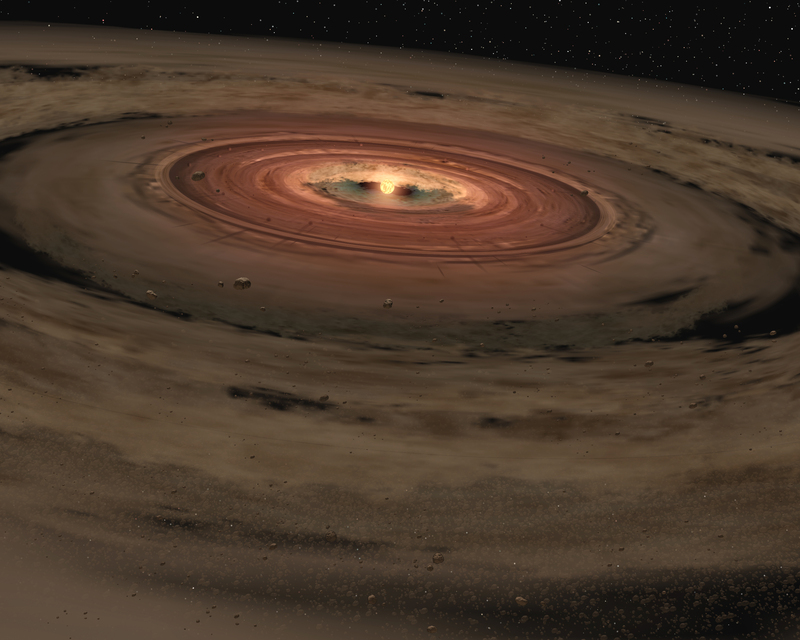 That rotation caused the mass of material to flatten out into a protoplanetary disk or pancake shape. As more material accreted onto the mass, pressures and temperatures increased until they were so great that our Sun was able to create fusion and spark to life. Much of the left over material was reclaimed by the Sun, much was blown away by solar radiation and a tiny fraction was able to independently clump together and form the planets in our solar system. The general distribution of material at the time of collapse caused the disk to rotate counter clockwise thus, the Sun rotates counter clockwise, all but two planets and about 90% of known asteroids rotate counter clockwise and all of these bodies orbit the Sun in a counter clockwise motion. The standout exceptions here are Venus, Uranus and Pluto. Both orbit the Sun counter clockwise like everyone else but for reasons currently unknown Venus, Uranus and Pluto rotate clockwise, completely opposite, but Uranus and Pluto are also laying on their side. To visualize that, picture Uranus and Pluto rolling around the plane of the solar system vs. standing vertically. Another strange oddity in the solar system is Neptune’s moon, Triton which orbits its host planet in the opposite direction that the planet rotates, which is called retrograde orbit. So the planet rotates counter clockwise while Triton somehow orbits Neptune clockwise. Because of this, it’s believed to be a captured dwarf planet. So that’s my spin on spin in the universe. Though we didn’t go into great detail, hopefully you learned something or at least gave you some fuel for thought. Image | This entry was posted in Astronomy (Learning), Solar System, Thinkers and tagged Astronomy, DanSpace77, Earth, Mars, Pluto, Protoplanetary Disk, Solar System, Space, Venus. Bookmark the permalink.